As the Jubilee of Mercy nears, the Holy Door of St. Peter’s is being prepared. Tuesday afternoon at 6.30 p.m. the ceremony was held for the “Recognitio” of the Holy Door of St. Peter’s Basilica. After a prayer by the cardinal archpriest Angelo Comastri, who led the procession of the Basilica Chapter, and the admonition of the Master of Ceremonies, four workers broke down the wall sealing the Holy Door inside the Basilica, extracting the metal chest held since the moment of closing the door during the Great Jubilee of the year 2000 and containing the “documents” of the last Holy Year, including the key to the Holy Door, the handles, the parchments, the paving stones and commemorative medals. 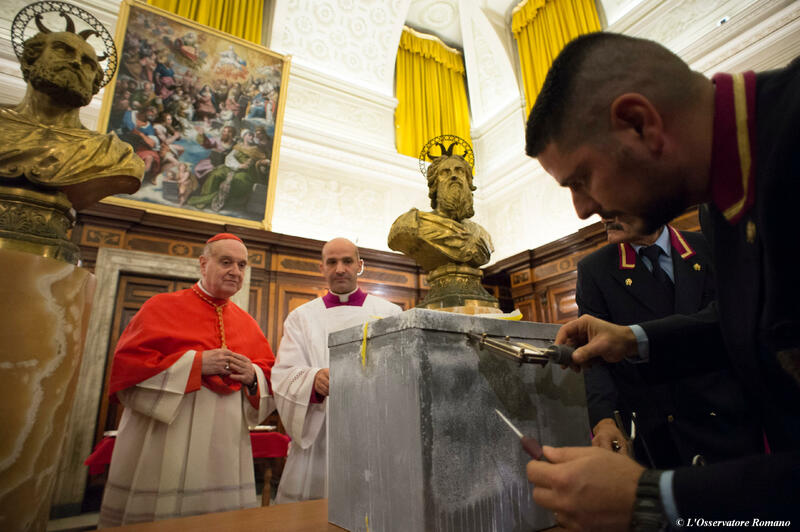 After praying at the Altar of Confession, the procession reached the chapter house where the metal chest extracted from the door was opened using a blowtorch, in the presence of the Master of liturgical ceremonies of His Holiness, Msgr. Guido Marini, who took delivery of the documents and the objects of the “Recognitio”, and Archbishop Rino Fisichella, president of the Pontifical Council for Promoting New Evangelisation. On Monday 16 November the same ceremony was held in the Basilica of St. John Lateran, and it will take place tomorrow in the Basilica of St. Mary Major, and on Monday 23 November in the Basilica of St. Paul Outside-the-Walls.